Although traditional braces are a tried-and-true way to get straight teeth, they certainly have some downsides, including frequent adjustment appointments and food restrictions. Luckily, they are not your only option that we offer at Wharton Dental. Straightening your teeth doesn’t have to entail having a metal mouth for two or more years. 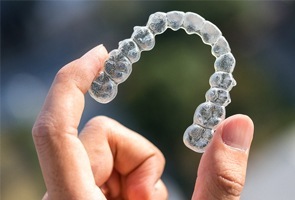 In fact, Invisalign clear alignment trays gently guide your teeth into position while maintaining your smile’s appearance. Faster results. Treatment with traditional braces can last up to 36 months, but Invisalign treatment typically takes 12 to 18 months to get the final results. Freedom to eat your favorite foods. Unlike with traditional braces, you have no restrictions on what you can eat. You simply remove the trays when you eat, brush your teeth, and then put them back in. Healthier mouth. Straightening your teeth does more than give you a better-looking smile. It also makes keeping your teeth clean much easier, helping you maintain your oral health. Confidence during treatment. Traditional braces can impact your self-esteem and make you want to hide your smile. 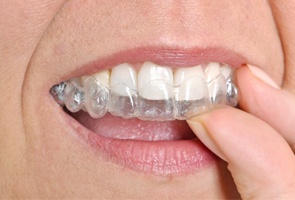 The clear trays are barely noticeable when worn, helping you keep your confidence while you straighten your teeth. Easy oral hygiene. Caring for your teeth is more challenging when you have to work around the brackets and wires. With Invisalign, you can remove the trays to brush and floss your teeth like normal and put them back in afterward. Easy care and maintenance. The clear trays are easy to wear and keep clean by brushing them every night with your toothbrush and toothpaste. What is the treatment process for Invisalign like? We will take impressions of your teeth and formulate a customized treatment plan. When your trays arrive, you will wear them for 20 to 22 hours every day, taking them out for eating and cleaning. After two weeks, you will throw these trays away and put in the next set. Every couple of months, you will come into our office so that we can check on your progress. If needed, we can make adjustments to your treatment plan. Invisalign is a great treatment option for anyone who has healthy teeth but wants to have them straightened. It can be used on teens or adults with mild or moderate misalignment. If more advanced treatment is needed or if following instructions presents a problem, then traditional braces could be the best option. The only way to know for sure whether Invisalign is right for you or your teen is to schedule a consultation with one of our dentists to discuss your specific needs. Our compassionate, helpful team is here to help you achieve your smile goals. We would love to meet with you and talk about how we can give you the straight smile you’ve always wanted. Schedule an appointment with us today!